Learn vocabulary through physical movement? Learn math through poetry or rap? Absolutely - with the help of Eight Ways of Teaching! This updated, practical guidebook takes you through each of the eight intelligences - verbal, mathematical, visual, kinesthetic, rhythmic, interpersonal, intrapersonal, and naturalist - and shows you new ways to create your own lessons using these intelligences. 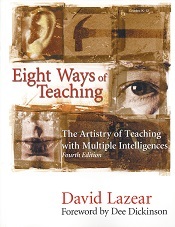 This new edition also offers suggestions on how to use technology to enhance each of the intelligences. An entirely new section - The 8-in-1 Lesson Planning Strategy - shows you how to create lessons that use all eight intelligences. Sample lessons are included - one each for elementary, middle, and secondary school. Updated with new research and strategies, Eight Ways of Teaching shows you how to transform your classroom and expand your teaching repertoire by exploring new ways for you to present, and your students to process, information.